Based on MK3 parts, this craft is entirely stock but will require that you have unlocked virtually all of the tech tree. Blizzard has been designed to be easy to use, while retaining excellent performance and great aesthetics. This craft has been designed to ensure that the COM remains ahead of the COL at all times within a normal flight envelope. This ensures user-friendly flight characteristics over the entire weight range of the aircraft, whether carrying a fuel fuel load or with the fuel tanks entirely empty. The excellent flight characteristics of this aircraft make flying on trim alone, very easy. SAS isn’t required, but adds further stability should you wish to make use of it. The flight surfaces have been fine tuned to give the best possible response over a wide range of airspeeds. Re-entry is a breeze, even with empty tanks. 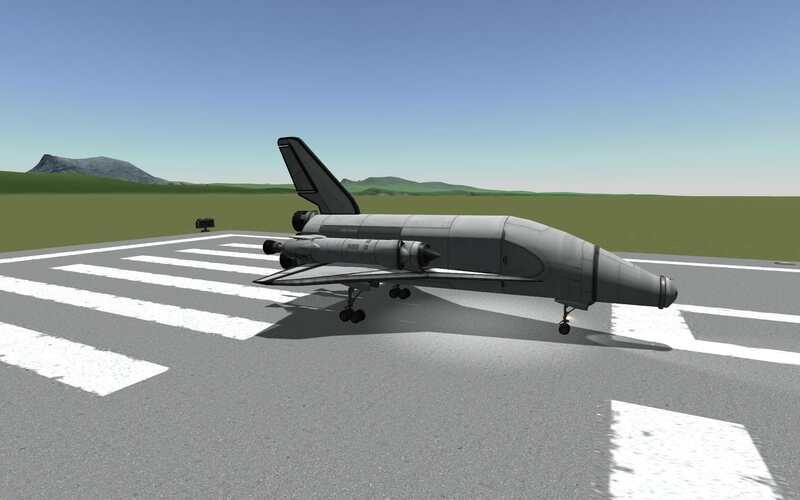 Blizzard ‘Tanker’ was built for operating from Laythe. This variant is a drone & has stageable nuclear engines, which should be dropped after making the final re-entry burn onto Laythe. Once landed on Laythe, ‘Tanker’ is capable of mining & refining fuel. Careful use of Laythe’s dunes is required to get a fully fuelled ‘Tanker’ back into low orbit.